Through the Stop Explosive Investments campaign the Cluster Munition Coalition strives to end investment in the production of cluster munitions. Banks, pension funds and other financial institutions are involved in the dirty business of funding cluster munition producers and we need to end this. We can’t do this alone, we need your help! Are you funding cluster bombs? Not many people know about the dirty business of their bank or pension fund and whether these are investing in cluster munition producers. There is an easy way to find out via the report Worldwide Investments in Cluster Munitions; a Shared Responsibility by CMC member organisation PAX (formerly IKV Pax Christi). Check out the ‘Hall of Shame’ – a listing of financial institutions that invest in cluster munitions producers. Take action to encourage your bank or government to introduce a policy against investments in cluster munition producers. The list of activities below shows you some easy options with which you can help spread the message to Stop Explosive Investments! Get writing! Write your bank and other financial institutions urging they introduce a policy against investment in cluster munition producers. Also write your government and encourage it to introduce a law banning investments in cluster munitions producers. We have pre-drafted letters that you can personalise and use to send to your bank or government. As a first step, request a meeting with the person responsible, offering to discuss the issue in more depth. Ban your bank. If the bank you are with is in the ‘Hall of Shame’, you might want to leave your bank for a bank that is in the ‘Hall of Fame’ Find out what steps you need to take to change your bank and go for it. As you do it, send a letter to your bank to announce that you are leaving them because of their investment in cluster munition producers. ATM boycott. Try to boycott the ATM machines of banks in the ‘Hall of Shame’. Banks profit from the money you take from their ATM machines, which could indirectly end up with cluster munitions producers. Therefore, try to walk a little further if you are able to get money out of an ATM of a bank in the ‘Hall of Fame’ category. Tell your friends and family about it and encourage them to do the same. Work with Parliamentarians. If your country has already joined the Convention on Cluster Munitions, meet with an MP or influential parliamentarians to ask that they: (1) Support an inclusion in national implementing legislation (if your country is in the process of ratifying the CCM) or otherwise standalone legislation prohibiting investment in cluster munition producers. (2) Urge the government to declare that it considers investment in cluster munition producers to be prohibited under the CCM. Check out http://stopexplosiveinvestments to find the latest information on your country’s position on disinvestment. Pressure financial institutions. Organise a creative action targeting your government or financial institutions in your country that are investing in cluster munitions. The Stop Explosive Investments global day of action is a good opportunity to take action, and think also about other days throughout the year. You could distribute flyers outside financial institutions, hold a demonstration, you could even become a shareholder and raise the issue of investment in cluster munitions producers at the annual general meeting. Think creatively, there’s lots you can do to get your message noticed! Campaign in the media and online. Contact journalists to tell them which financial institutions have financial links with cluster munition producers or why your government is failing to stop such practices. 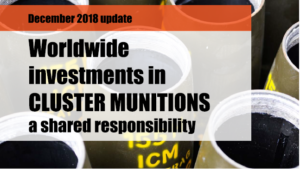 Use information in the Worldwide Investments in Cluster Munitions; a shared responsibility report to give them the facts. Consider a press release, letter to the editor of financial publications, write an op-ed, or even place an advertorial if you have the resources. Online, use twitter to spread the message against investment in cluster munition producers use the hashtags #banclusterbombs and #disinvest and tweet directly to financial institutions, their chief executives, politicians and financial journalists. Use Facebook, Flickr and YouTube too – check out the Stop Explosives Investments campaign toolkit for films and graphics you can use.